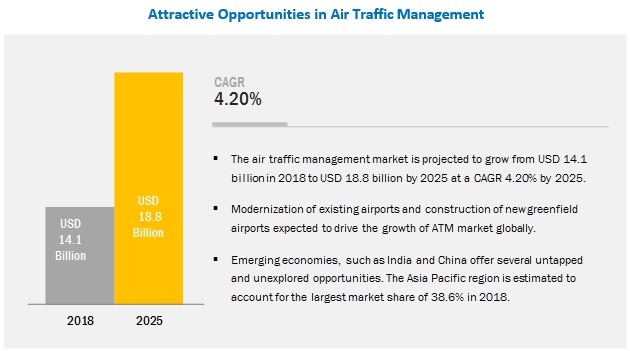 [169 Pages Report] The Air Traffic Management (ATM) market is projected to grow from an estimated USD 14.1 billion in 2018 to 18.8 billion by 2025, at a CAGR of 4.20% during the forecast period. Increasing global airport investments and upgradation of ATM systems are expected to drive the growth of the market. Based on airspace, the ATM market has been segmented into Air Traffic Services, Airspace Management, Air Traffic Flow Management, and Aeronautical Information Management. The Aeronautical Information Management (AIM) segment is projected to grow at the highest CAGR during the forecast period. Growth of this segment can be attributed to the real-time aeronautical information that is supplied in the form of data and is updated regularly for safe, efficient, and economical ATM. Based on end use, the ATM market has been segmented into commercial, and tactical. The commercial segment is estimated to account for the largest share of the market in 2018. Due to higher commercial air traffic and extensive use of ATM systems for day to day commercial air travel, along with timely upgradations of these systems are the drivers for the commercial segment. Based on component, the market has been segmented into Hardware, and Software. The software segment is projected to grow at the highest CAGR during the forecast period. 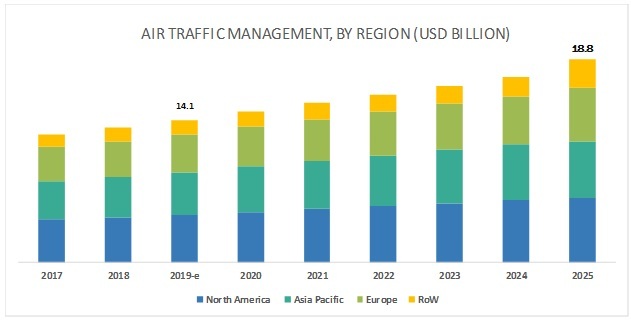 The growth of this segment can be attributed to the increasing automation in air traffic management which will require advanced software algorithms. Based on investment type, the market has been segmented into Brownfield and Greenfield. The brownfield segment is projected to grow at a higher CAGR during the forecast period. Growth of this segment can be attributed to the higher investments in modernizing, renovating, and upgrading existing airports in both, emerging and developed economies. The ATM market has been studied for North America, Europe, Asia Pacific, Middle East, and Rest of the World (includes Africa and Latin America). Asia Pacific is estimated to account for largest share of the global market in 2018. Air traffic in the Asia Pacific has been growing at a high rate, which has led to the demand for more airports and modernization of existing ones. China is the largest market in this region, followed by India. Rise in air passenger traffic has led to the introduction of new airlines, which has led to an increase in the number of aircraft deliveries, which is simultaneously expected to boost the market in this region. Asia Pacific is expected to continue to lead the market during the forecast period. The high cost of ATM equipment is one of the factors restraining the growth of the market. The major strategies undertaken by various companies include new product developments and contracts. The competitive leadership mapping matrix compares various companies operating in the market. Major players in the market are Thales Group (France), Raytheon Company (US), Indra Sistemas, S.A. (Spain), Harris Corporation (US), Northrop Grumman Corporation (US), Honeywell International, Inc. (US), BAE Systems PLC (UK), and Saab AB (Sweden), among others. In February 2019, the US Air Force has awarded a contract of USD 59 Million to Northrop Grumman for the development and manufacture of the embedded Global Positioning System (GPS). In December 2018, Harris Corporation received a contract from the US Army to provide wideband satellite communications. Under this contract, Wideband Satellite Communications Operations and Technical Support II (WSOTS-2) will support the US Army with mission-critical communication. In October 2018, Indra Sistemas received a contract to provide InNOVA Approach and Tower display surveillance data processing system to the Inverness Airport. This contract was awarded by Highlands and Islands Airports (HIAL). The company operates and manages more than 10 airports in Scotland. What will be the impact of regulations on the ATM market? How will region wise programs for ATM (Single European Sky, OneSKY, and NextGen) disrupt the industry? How are the market players in industry addressing challenges, such as Rise in cyber threats in Air Traffic Managemen’? How are changing demands of customers impacting the competitive landscape? What will impact leading market players’ wallet share in the next 5 years? What is helping the top players in the market to sustain and grow their market share? How will increasing airport investments affect the market? The study involved 4 major activities to estimate the current market size for Air Traffic Management (ATM). Exhaustive secondary research was done to collect information on the market, peer market, and parent market. The next step was to validate these findings, assumptions, and sizing with industry experts across the value chain through primary research. Both, top-down and bottom-up approaches were employed to estimate the complete market size. Thereafter, market breakdown and data triangulation procedures were used to estimate the market size of segments and subsegments. In the secondary research process, various secondary sources such as Hoovers, Bloomberg BusinessWeek, and Dun & Bradstreet have been referred to, so as to identify and collect information for this study. These secondary sources included annual reports, press releases & investor presentations of companies, white papers, certified publications, articles by recognized authors, gold standard & silver standard websites, regulatory bodies, trade directories, and databases. Prominent companies that provide ATM Products, Small and Medium Enterprises (SMEs), distributors, and end-customers (aircraft manufacturers and airline companies) are the key stakeholders in the supply chain of the ATM market. The demand side of this market is characterized by increase in airport investments. The supply side is characterized by advancements in technology and modernization of existing ATM systems. Various primary sources from both, the supply and demand sides of the market were interviewed to obtain qualitative and quantitative information. Following is the breakdown of primary respondents. After arriving at the overall market size—using the market size estimation processes as explained above—the market was split into several segments and subsegments. 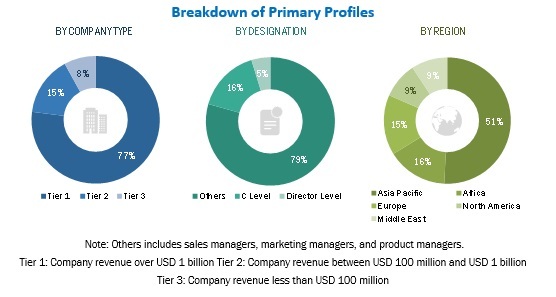 In order to complete the overall market engineering process and arrive at the exact statistics of each market segment and subsegment, data triangulation and market breakdown procedures were employed, wherever applicable. The data was triangulated by studying various factors and trends from both, the demand and supply sides. To analyze competitive developments, such as expansions & investments, new product launches, mergers & acquisitions, joint ventures, and agreements in the ATM market. Thales Group (France), Raytheon Company (US), Indra Sistemas, S.A. (Spain), Harris Corporation (US), Northrop Grumman Corporation (US), Honeywell International, Inc. (US), BAE Systems PLC (UK), and Saab AB (Sweden). A total of 15 major players covered.